Now the advice when starting a new project with some unknowns thrown in is to knit a swatch but what to do in this case?! I knew I wanted it to be a mixture of a little bit of knitting but mostly created through using pre-loved woollen garments.Anyway after a bit of pondering I decided to create not a swatch but a small prototype. 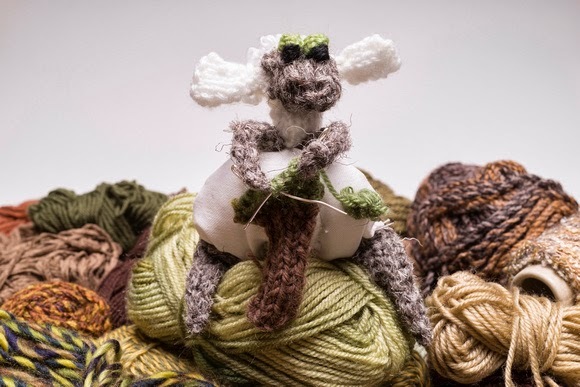 Largely because I had bits of white cotton kicking around;the prototype turned out to be a knitting sheep. It meant I tested out the overall effect a bit and had somewhere to start when it came to the real thing. For my 'proper' creature ie my bird, I had a slightly moth-eaten Fair Isle cardi bought from a charity shop in fawns and greys and browns and it seemed perfect for the main role in this upcycling opportunity. I forgot to take any photos as I went along so here is the finished character, my knitting bird, with some idea of what I did along the way. I loved the colours and pattern on the Fair Isle cardi as a rather nice patterned bird body but wanted them to be quite subtle so turned the garment inside out (I also liked the idea of the seams being visible on the outside) and then just stuffed the sleeves inside and turned the bottom rib up to help give it some stuffing. Next I found a charity shop gent's jumper and cut off the sleeves to make the wings, sewing them into a tapering point I attached them to the shoulders and used the rest of the jumper also to stuff the body. When it came to legs I made a couple of short cord lengths and used a shaped piece of felt attached to the end of the body for that nice Chicken Run/Aardman Animation look. Now the body was looking ok I needed a head - at first I thought like the prototype I'd knit it but then remembered a handknit bag I'd knitted already and no longer used; it was perfect for reshaping into that long round shape and had different colours front and back. On went the head, pushed into the neck of the cardi and again stuffed with itself. A scarf (made from a discarded piece of picture knitting left behind from a previous art project) helped to give the head/neck a bit of support. 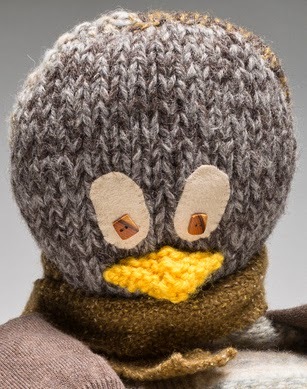 For that look of intense concentration I knitted a nice yellow beak, attached a couple of wooden button eyes on ovals of felt and the bird itself was complete. 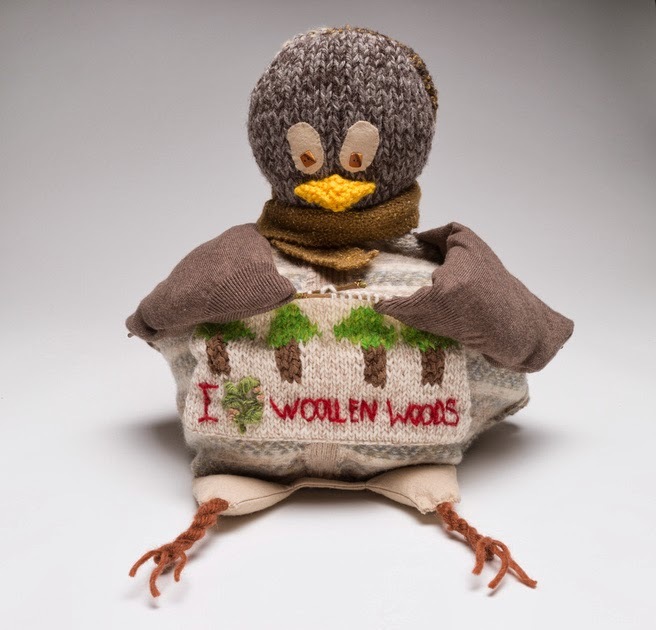 Finally, I knitted the knitting that the bird was knitting (is that too many 'knit' words in one sentence?). 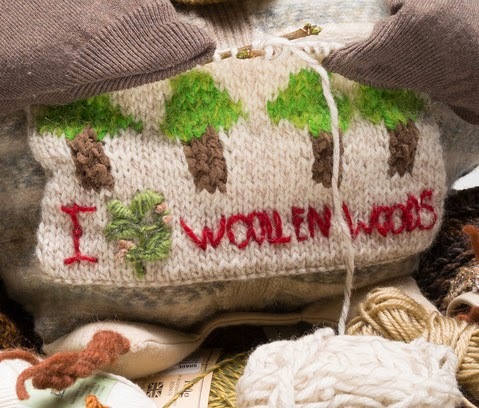 I used intarsia for the trees but added the letters and National Trust oak leaf on with coloured wool afterwards with a sewing needle and wool. The last thing needed was a shifty visit to the park for a few small branches snipped off to be the bird's knitting needles; I slipped the knitting into position and tacked it in a few places to keep it in position and tucked the knitting needles under the wings and there we have it. 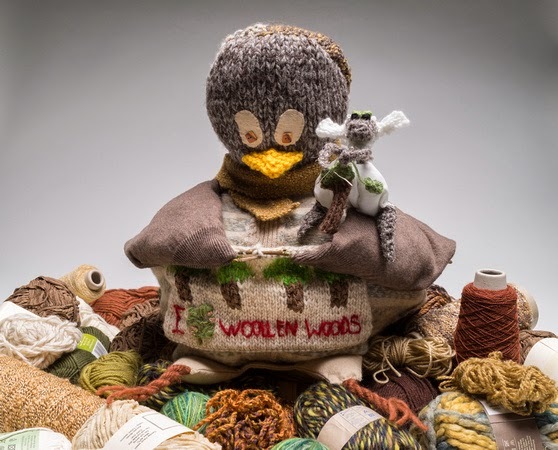 Don't you just love how things evolve - from small knitting sheep into large knitting bird! 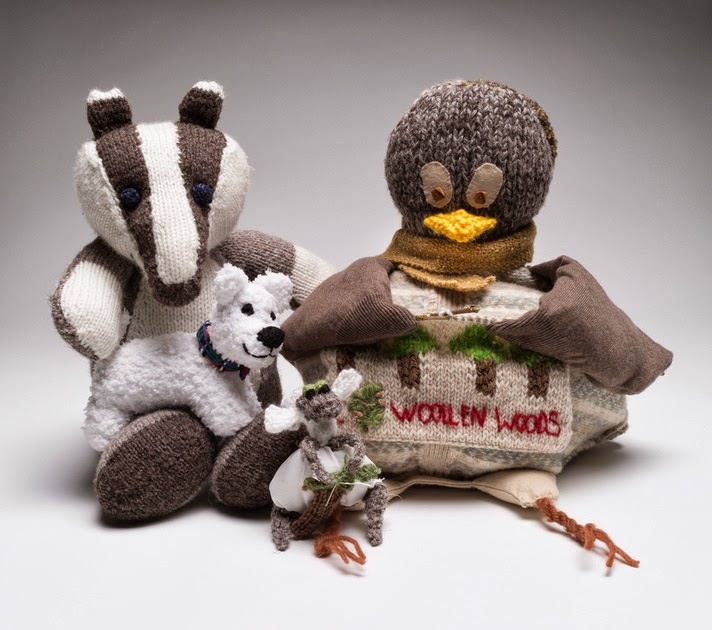 From prototype knitting sheep to my finished knitting bird complete with message! 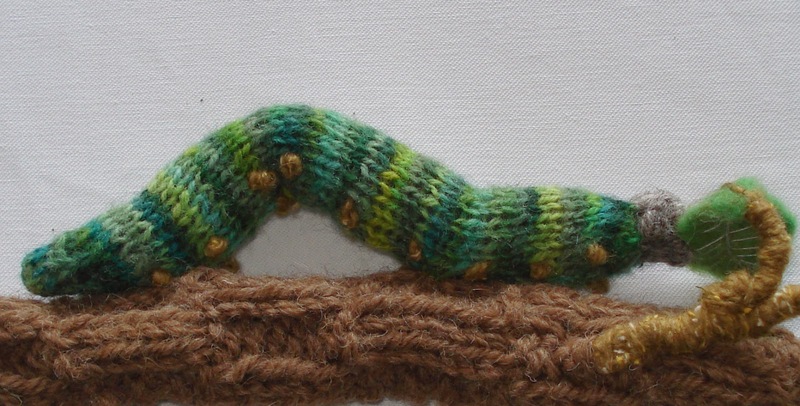 When I can I'm making textile art or blogging about it; here's my web site; or follow me on Facebook and Twitter for my knitting and textile art news.